The announcer’s voice booms “6 … 5 … 4 … 3 … 2 … 1 …” And then, the starting horn blares. 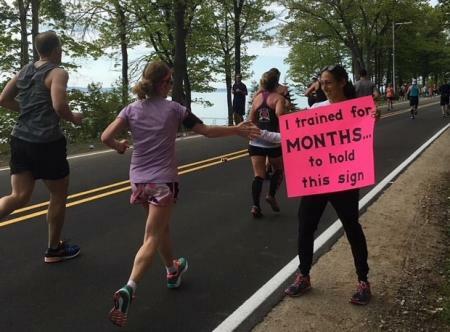 The crowd gathered on each side of this Northwestern Michigan College campus street hoots and hollers, shouting their runner’s name. It’s go time at the Bayshore Marathon, a kick-off-to-summer Memorial Day weekend tradition in my hometown of Traverse City. I walk-run to the timing mats amid the throng of runners – we all set our watches to start at this point, when we can really begin our race – and I remind myself to not go out too fast. It’s a common mistake even the most experienced of runners can make if we’re not careful. Race-day adrenaline has a way of doing this to you. We have a literal long road ahead – 26.2 miles of pavement to be exact. Pacing yourself is critical. And with the marathon distance, incredibly critical. Since becoming a runner 12 years ago and racing varying distances, I’ve come to love the marathon most of all. The training commitment required (18 weeks typically) is mind-boggling to many people, and I admit it has felt overwhelming and daunting at particularly busy times of my life. But carving out the time, making the miles a priority, and then actually experiencing the joy and pain and satisfaction of crossing the finish line after 26.2 mentally and physically exhausting miles is nothing short of transformative. Each marathon I’ve completed, whether I finished with a personal best time or struggled intensely just to make it in, sheds new light on myself – my abilities, my mental and physical strength, ultimately my view of the world. And of the eight marathons I’ve run, including Boston and Marquette and San Francisco, Bayshore remains the race. This event is a perfect not-too-big, not-too-small road race and the course is flat and scenic. The volunteers and aid station workers and spectators are encouraging and wonderful (last year&apos;s runners were even treated to an Olympian cheering them on!) It’s also home to me – I’m fairly certain I know, like the back of my hand, about 97.2% of the dips and curves on the stretches of Eastshore Drive, Center Road, and Bluff Road – and I know it’s left this same imprint on many other runners as well. 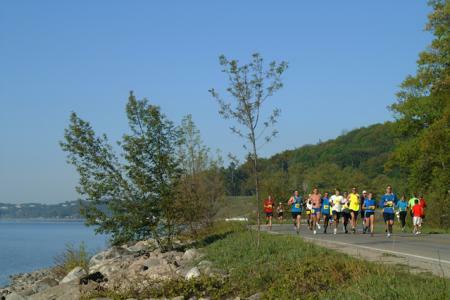 The Traverse City Track Club Bayshore races – there’s a half marathon and 10K in addition to the marathon – are among the most popular in the state. When registration opens in early December each year, the half fills within hours, the 10K within days. The marathon, capped at 2,250 runners, is nearly filled (about 250 spots still remain for those who want to join me!). 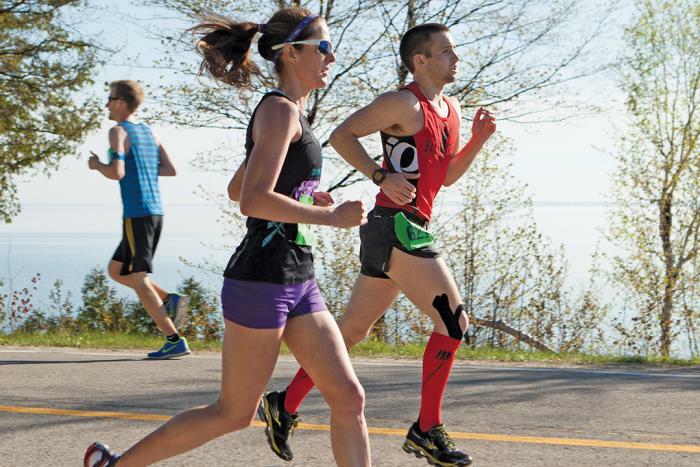 Falling on Memorial Day weekend, the Bayshore is a destination race for many people – 84% of participants come from outside the area, according to TC Track Club findings in 2016. It’s a big weekend for my hometown: the thousands of runners and their families here have a weekend impact on the local economy totaling $1.9 million. In 2018, I toed the start line of the Bayshore Marathon, with a special running partner: my 17-year-old daughter Emma. A high school cross-country runner who decided to start running half marathons a couple of years ago, Emma decided, just after graduating high school, she’d tackle 26.2. To say I could not wait to experience this with her, after months of training together in all kinds of weather, doesn’t do justice to the emotions I felt! And this year (2019) Emma and I are back for another, but shorter round of this race. She&apos;ll be heading out onto to the 13.1 course and I&apos;ll be taking on the 10K -- different distances, but still side by side in spirit. Run the first part with your head, the middle part with your personality, and the last part with your heart.